Anyone working on an educational program recognizes the importance of developing a speaker evaluation form to measure the effectiveness of an overall program or individual break out session. It's a challenge for most meeting and event planners, and it’s a step that many would like to overlook. A good speaker evaluation form can be used as an important tool to measure the effectiveness of a given program, and it can be used as a tool the measure the contribution that a meeting has on an organization’s objectives. Perhaps the biggest challenge of a speaker evaluation form is making it easy to complete. Although most attendees expect to complete an evaluation, it’s helpful to remember that they are usually more interested in leaving a session immediately than filling out a lengthy evaluation form. Recognizing this challenge, some planners provide an incentive for attendees to complete the form. It is an opportunity for the planner to have some fun and reinforce the company and may include promotional items from the organization or even gift certificates. List the session name and speaker. Measure the effectiveness in a maximum of five options. Ask if the session objectives were met. Ask if the session was perceived as valuable. Ask an open-ended question for more information. Keep the form optionally anonymous. Ask if there’s any interest in follow-up contact. To be sure, feedback on evaluation forms will be subjective, as the comments are based on many personal factors of who is responding. For example, those who attend a given program will likely be at different levels of professional experience with a given topic, and that will impact how they respond. Their feedback may also vary based on different expectations of a program before attending. The National Speakers Association (NSA), Tempe, AZ, has developed a speaker evaluation form template that it uses at meetings to evaluate its own educational sessions. Please rate how well this session’s learning objectives were met? 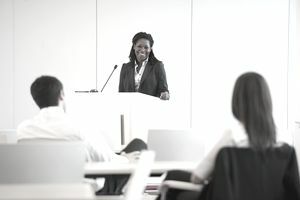 NSA was established in 1973 and is a leading organization for professional speakers, providing resources and education designed to advance the skills, integrity, and value of the speaking profession. Once the evaluation forms are collected, event organizers should compile the results into a report that summarizes all the results. It includes information about speaker ratings in the various categories measured, as well as the comments themselves. Such reports are used to measure how effectively a seminar or conference session met the needs of the audience, and what may be improved in the future. Motivational speaker Pegine Echevarria of Team Pegine Inc., Ponte Vedra Beach, FL, suggests that meeting planners tally results into a report called an After Action Report. What ideas do I have for future events?